Last year, reports started to appear in the news media of employers discriminating against the unemployed, saying they would not consider anyone currently unemployed for various jobs they were advertising. One company singled out for this practice was Sony Ericsson. As reported by Adam Cohen of Time Magazine last March, the company had put up an online job posting a year earlier stating, “No unemployed candidates will be considered at all.” The company later claimed this was an error, but it’s hard to believe this was a simple typo. Someone at that company was thinking that they’d rather not hire anyone who is unemployed. Whether this sort of discrimination is a systemic problem or just a few anecdotal aberrations of a more fair minded hiring culture in the country is still open to debate. While discrimination based on employment status isn’t illegal under federal law, the problem seemed real enough for Governor Chris Christie of New Jersey to sign a bill making it illegal for employers to specify in their job ads that unemployed persons will not be considered. As reported by Laura Bassett of The Huffington Post in April, the law states employers would face a penalty of $1,000 for the first offense and $5,000 for subsequent offenses. Legalities aside, employers should re-think the practice of not hiring currently unemployed, if only because at this point it so limits their candidate pool. With such high employment, many qualified candidates may be unemployed for over a year. 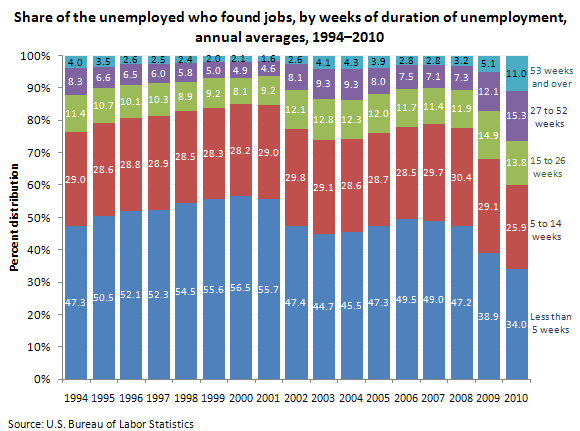 Back in 2007, before the financial crisis, only 3 percent of people who returned to the work force after a period of unemployment had been unemployed for more than a year. In 2010, that number was up to 11 percent. That’s a lot of people to just cut out of the equation, many if not most of them qualified, competent people, who want nothing more than to find a job.